Large companies do a lot of philanthropic and community giving. Comcast is not alone on that front: volunteerism, grants, donations, and employee matching are common, perhaps even standard, at many of America’s biggest businesses. But where Comcast differs is that they, very publicly, turn their valuable giving into an unpaid army of on-demand lobbyists whenever they have a company to buy. Like Time Warner Cable. The New York Times reports that — you are shocked, we’re sure — a whole boatload of the support for the merger comes from groups that Comcast has given money to in the past. This is not a new pattern for Comcast. The New York Times reported basically the same story a year ago, and back in 2010 when Comcast was trying (successfully) to gain approval to buy NBCUniversal. And Comcast does it because frankly, it works. Not only is it good PR to work with nonprofits and disadvantaged communities (as basically every large business does to some degree), but also the cable giant gets support in return. When the FCC’s comment cycle on the Comcast/TWC merger closed, Comcast was accurately able to brag that over 600 letters of support for Comcast and the merger had come in. Comcast conveniently collates those messages by sector, so you can see the businesses, community organizations, and chambers of commerce that have written in support of the company. They are, to be sure, worthy organizations. They are also all organizations that have received grants, donations, or volunteer man-hours from Comcast. Comcast, and the nonprofits that act in support of it, all insist there is not a quid-pro-quo agreement in place and that is certainly true. But small groups with small operating budgets, that rely on grant money and donations, are not fools. They like to keep their donors happy, and hopefully win future grants in the future. And so they willingly support the organization that helps keep them afloat, and who can blame them? The implicit argument therefore goes: Comcast is great because it is big. Because it is big, it can give away money to little groups like us. Little groups need the money. If Comcast gets bigger, it will have more money to give away and will operate in more states where there are groups that need money. 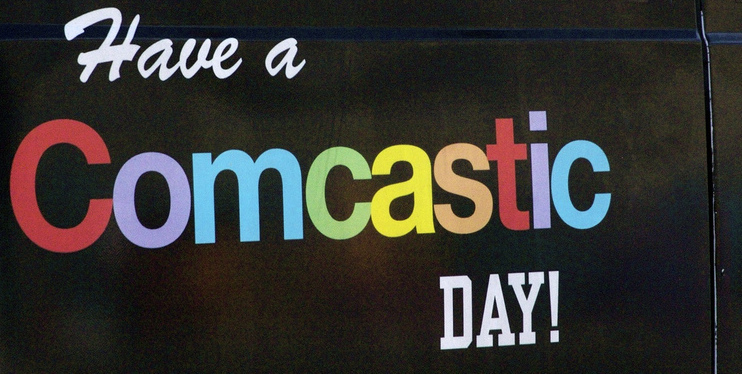 Therefore, Comcast should get bigger and it will be great. It’s not quite astroturfing, as some have called it. But it is a big bag of well-calculated chtuzpah. Comcast touts its relationship with Hispanic and Latino organizations, even while having an ugly carriage fight with a Spanish-language network. They tout their commitment to media democratization while fighting against the open, democratic internet. Contact with community organizations is just one pillar in the strategy. Lawmakers, local and national, are brought on board too. But lobbying and political giving are an entirely different sort of philanthropy. Comcast, however, clearly needs every tool at its disposal. The merger, which seemed (to Comcast at least) to be a foregone conclusion last year, has been fighting an uphill battle for over a year. Public sentiment on the matter is, philanthropy aside, overwhelmingly negative. As time drags on, analysts have been downgrading the likelihood of it happening. In the meantime, the review is still on hold due to technical concerns about confidentiality issues. And so we all wait, while Comcast continues to throw money at the problem, to hope it will be resolved in their favor.